UPDATE MARCH 2015: Councilwoman Cindy Bass and the Philadelphia Redevelopment Authority have committed $4 million for the immediate stabilization of the building and plan to release another RFP for its rehabilitation this spring. CLICK HERE for Councilwoman Bass’s March 19th announcement. 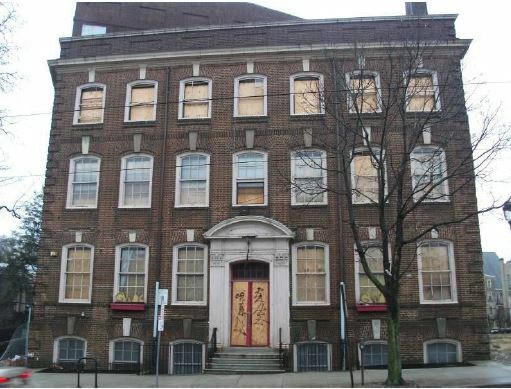 The Philadelphia Redevelopment Authority has declined the lone offer it received for the historic Germantown YWCA (5820-24 Germantown Ave) following an RFP it issued in September 2014. A proposal by Mission First Housing Group, Center in the Park, and Philly Office Retail for a 50-unit senior housing development failed to get the support of Councilwoman Cindy Bass, who believes there are other reuse options for the building and has initiated a community-driven process to solicit additional proposals. Neighbors and preservationists fear that the long-vacant building could be demolished before another viable offer for the property materializes. The building has been a neighborhood anchor since its construction in 1914, and was listed on the Philadelphia Register of Historic Places in 1984. On January 22, 2015, Germantown United CDC hosted an emergency community meeting to discuss the PRA decision and its future plans for the property. PRA executive director Brian Abernathy acknowledged the City of Philadelphia’s role in allowing the building to deteriorate over the last decade, but cautioned that city funds were likely not available for its immediate stabilization. He promised to share the results of a recent L&I inspection of the property to determine its structural condition. Visit Germantown United CDC’s website for a video recording of the January meeting and for updates as they become available.